A simple but moving memoir of three fiercely inspiring families. In the late —70s, Clark (Wystan and Chester: A Memoir of W.H. Auden and Chester Kallman,1996), along with her husband, opened their home in Italy’s Tuscany to an ethnically Chinese refugee family from Vietnam and to the four surviving members of a Cambodian clan. Fusing contemporary history with individual sagas and her own personal reflections, Clark successfully unveils the backgrounds and the personal travails of all concerned. What this memoir does best, however, is to paint the horrors of the Khmer Rouge as seen from the perspective of the children who survived its reign. The camps were marked by drudgery and cruelty. Upon their arrival, children were separated from their parents, stripped of their clothes, and dressed in black. Their constant companion was hunger; the penalty for hoarding food was stoning, usually pursued to the point of death. Indoctrinated rather than educated, children were encouraged to spy on one another and on their parents. They were expected to work from early morning until late at night. Illness was widespread. Rapes were common. Coconut juice took medicine’s place. Having lived through this nightmare, the three Cambodian children who arrive in the author’s Tuscan village feel wary of human contact while also hungering for it. It’s to Clark’s credit that healing occurs, fears are overcome, and trust is established. As the children begin again at last to value themselves, their past experiences serve to strengthen rather than hinder them. Clark doesn—t gloss over their difficulties: Changes and departures of any kind remain exacting challenges for them. Yet they learn Italian, grow accustomed to school, make friends, and rebuild their lives. 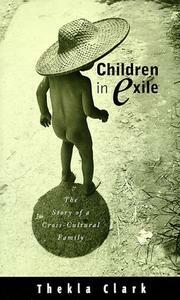 For its historical and social significance, Children in Exile makes a valuable contribution to the literature of 20th-century Asian refugees.